Pyrolysis plant TDP-2-200 was shipped by IPEC Company to the client, oil producing enterprise Lukoil Komi. The continuous TDP-2-200 plant with the capacity of 200 kg per hour features enhanced structural design, which goes inside the frame of 40’ standard sea container, together with loading/unloading assemblies, unlike the previous version. This solution facilitates considerably transportation and assembling of the equipment. The Lukoil Komi is the second largest oil production company in Lukoil, which involves large scale drilling waste generation by the Company and therefore necessity of cutting edge waste utilization equipment of high capacity. 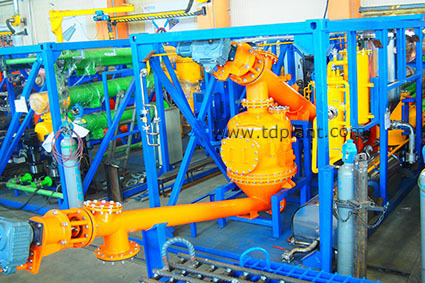 The commissioning of the TDP-2-200 plant into operation would allow to meet the challenge of accumulated waste as well as to cope with newly formed one.